The last concrete beam has been placed atop the Offices at Chandler Viridian, a six-story, Class A office building with 250,000-square-feet of space located at the intersection of Loop 101 and Loop 202 near the Chandler Fashion Center. 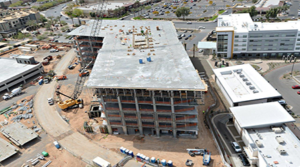 The building will be the tallest multi-tenant office building in Chandler at completion. Also featured in the master plan is a dog park, ¾-mile jogging trail connecting all of the properties, and a large public plaza with high-speed Internet and Wi-Fi – all to enhance the pedestrian experience. Stantec has signed a long-term office lease. The office building will have a large, open floorplan with 10-foot tall ceilings, a lounge and large courtyard.